Do you use the built-in ruler on your saw fences? Many people don’t trust them, especially when they need a super-accurate cut. 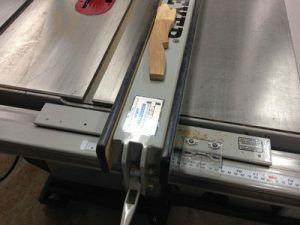 Whether on the table saw or miter saw, some use a rule to measure the distance between the blade and fence. And, certainly, that’s the way to get the best-fitting parts. I spent a lot of time calibrating the scale on my Delta cabinet saw, and it’s quite accurate, but it’s set for my Forrest Woodworker II. If I use my thin-kerf, coarse-tooth Craftsman blade, that measurement changes. I use the scale only when the cut doesn’t have to be perfect. It takes little time to make that measurement, and, if you’re batching parts, you need measure only once. It would take a lot longer to make all those pieces a second time. I’ve fine-tuned the scale on the Delta cabinet saw to its best accuracy, but I still measure the distance between the blade and the fence when cutting furniture parts. I put a scale on my Norm Abram miter saw stand, but I don’t use it. The plans included instructions for a movable stop, but, when I got through with the project I was out of time and never got around to making that clamp. I would use the stop, if I ever got around to making one, because I perform a lot of repetitive cuts. However, I still measure the distance between the blade and the stop, despite the fact that I’ve checked the tape repeatedly, and it’s always right on the money. The tape on this Norm Abram-style miter stand is very, very accurate, but I still don’t use it. One day I’ll make Norm’s movable stop, but, in the meantime, this setup works quite well. And, what do you use to measure? I’m not trusting of tapes when perfection is on the line. After all, a movable hook is the antithesis of accuracy. I will use a tape and start at the 1″ mark sometimes, but that doesn’t work when measuring against a blade or fence. That’s when I drag out my father’s old folding rule. There’s no disputing the meaningfulness of a measurement from one of those! I often keep a folding rule in my pocket when building furniture. Their accuracy is without peer. The bottom four were Daddy’s. 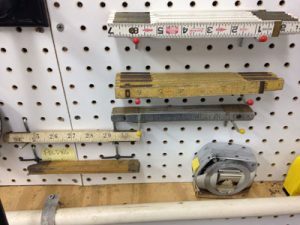 He’s 95 and still very spry, but no longer needs his measuring tools. We are blessed. This is the ONE thing I miss on my old right tilt saw. With the flange on the right, the distance from the blade to the fence NEVER changed, no matter which blade I am using. I adjust my ruler as accurately as possible, then make a test cut and measure the ACTUAL result, then tweak the cursor if necessary. I always spend one weekend a month on cleaning and tuning all of my tools. That way I know that the accuracy of the tools is right on and if there are any issues about maintenance. I always use the fence measurement, but it is an INCRA and once set to 0 it is never off. 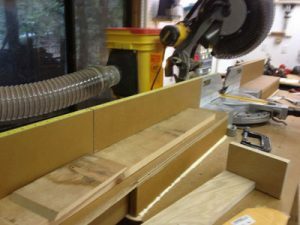 I mostly depend on the saws tape on my Delta unisaw and use the stops on my mitersaw station equipped with the Kreg miter saw system. I have found them to be accurate enough for most of my work if they are off a thousandth of an inch they all will be the same if you depend on the stops . Better to verify settings when it is critical in spite of the confidence I have in the setting. Also, I use my dad’s [now mine] folding rule, it beats the sloppy [falling out of line] retractable when measuring less than a couple of feet. I have a Ridgid table saw that is a good contractor style saw but the plastic “window” that sits above the scale magnifies the scale below, but with a curvature that makes the scale much harder to read. It would be much simpler without the magnifier. When building furniture I try to work in 1/64 inch accuracy. I can do that without my rule to measure distance from blade to fence. I have found the scale on my saw fence to be very accurate with a Woodworker II blade which is the blade I use most of the time. I use the ruler on my Sawstop fence and find it accurate for most cuts. When super accuracy is needed I will double check the setting first. Use it all of the time, set to the blade you’re using and then get the habit of sighting over the ruler the same way every time and it’s dead on accurate! 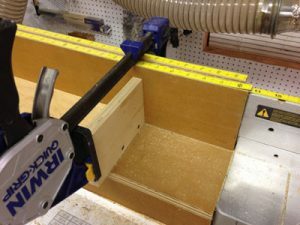 I use the built in ruler on both my chop saw and my table saw. Both are accurate to 1/32 inch. I also use it when I have to cut multiple pieces of the same measurement (width on table saw and length on chop saw with a stop block). While they might not be accurate to 1/64 inch all are consistent sizes which work well for many applications including drawer sides, fronts and backs. I USE THE DIGITAL RULER I INSTALLED BY WIXEY. IT IS ALWAYS DEAD ON NO MATTER WHAT BLADE I’M USING. I HAVE ONE ON THE TABLE SAW ,ROUTER TABLE, AND PLANNER . My SawStop fence is dead-on every time. My previous saws were not trustworthy but I trust my SawStop. I agree with Bob. Additionally, I always try to use the same tape measure or rule for all measurements so that if there is any inconsistency at least it’s consistent inconsistency. When using my Delta Unisaw, I usually rely on the built in scale for most cuts, but when accuracy counts, I always check the measurements using a Starrett rule. This way I can assure repeatable results.